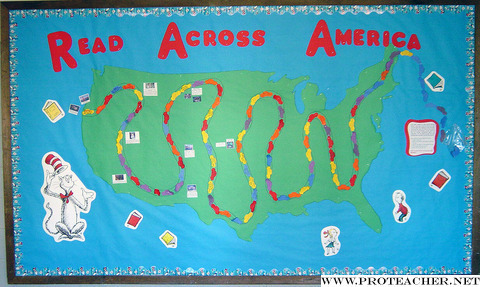 I displayed this bulletin board in our school lobby to celebrate Read Across America during the month of March. Students used the interactive board by reading a book and then writing the title and author of the book on a car cutout. The cars were then placed on the bulletin board along the road across America. As the cars traveled along the road, I placed special points of interest for students to read or "sight see." For example, there was information about the San Francisco bridge and the Grand Canyon. Our goal was to go from the west coast to the east coast. This interactive board gets students motivated to read and is lots of fun!